75 m x 1 Hz. Range increases down and Doppler frequency increases to the right. angular and rotates several tens of degrees during the sequence shown. 75 m x 1 Hz. (1.8 lunar distances) of Earth in 2172.
at Arecibo. Goldstone tracks are scheduled on February 3, 5, and 6 and Arecibo tracks are scheduled on Feb. 6 and 7. 2002 AJ129 has been classified as a "Potentially Hazardous Asteroid" by the Minor Planet Center. 2014 SR339 was discovered by NEOWISE on September 30, 2014 and the spacecraft thermal data suggest diameter of ~970 m.
This is an optically dark object with an albedo of 7%. Its other physical characteristics are unknown. be very strong and there are 3 tracks scheduled on Feb. 8, 9, and 11. 2014 SR339 has been classified as a "Potentially Hazardous Asteroid" by the Minor Planet Center. in January 2018 has yielded the same rotation period. Arecibo. Five tracks are scheduled at Goldstone between February 7-11. 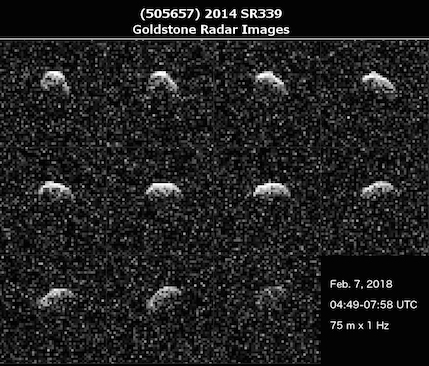 The asteroid is too far north for Arecibo to track at the time of closest approach. 2015 BN509 has been classified as a "Potentially Hazardous Asteroid" by the Minor Planet Center. 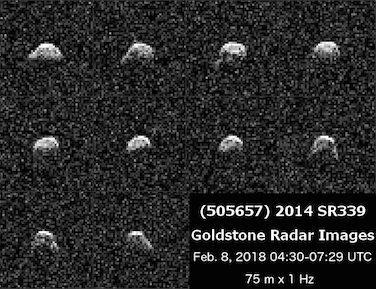 Heliocentric orbits of Goldstone radar targets in February 2018. Observer view of Goldstone radar targets in February 2018. These are the only dates when this object is visible at Arecibo.